More than just finding food, fishing is an activity enjoyed by many. For anglers, fishing is a sport, a hobby, or simply a time for bonding with your loved ones. For this activity, you need to come fully equipped with tools and skills to catch the biggest bass. What you can use to haul most of your stuff is a fishing backpack. It is much more efficient and convenient than a box or a backpack. It will be able to hold most of everything you need and provide mobility when you are on the move. So, for your next fishing trip, we have listed some of the best fishing backpacks you may want to try. If you want something that fits into your budget, this Spiderwire Fishing Tackle backpack is for you. This costs less than $65. This may not look like a traditional fishing backpack, but it definitely is built for that purpose. 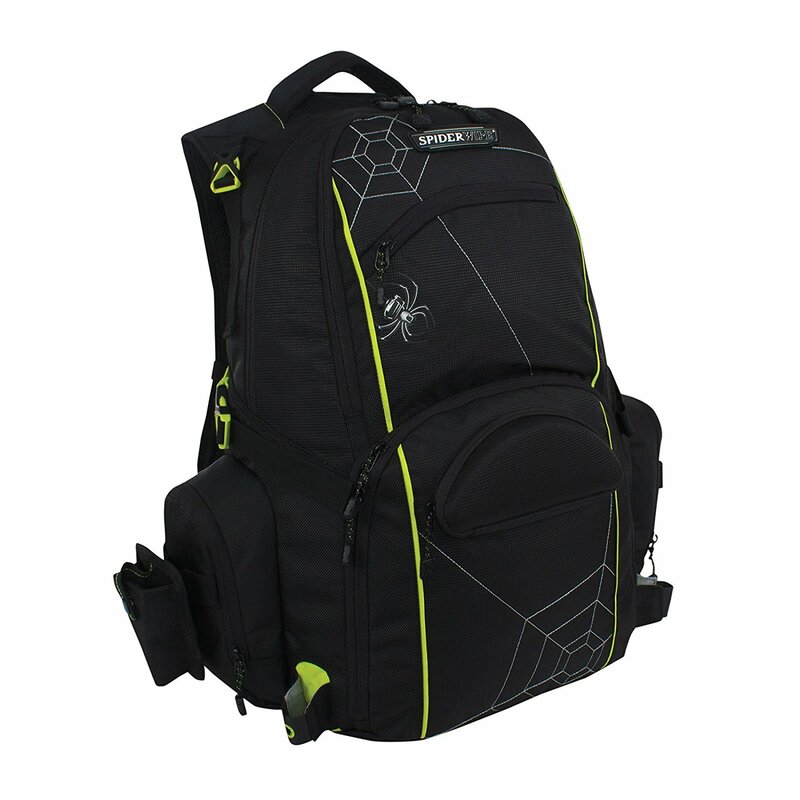 This backpack has many compartments for you to store all of your items. The top compartment can be used for your personal belongings like your phone and keys. The middle cooler compartment can store food, drinks, or bait. The lower compartment can fit three medium utility boxes. On the left and right side, are two other large pouches for other small items and removable fishing tool holders. There is also a foam molded sunglass case with soft lining. The bag is made of 100% polyester and has a flat bottom, so the bag sits upright. Whether you are on or off a boat or ice fishing, this backpack is a great choice. It has a large size and only costs less than $100. This backpack is large enough to fit your fishing tools and equipment. 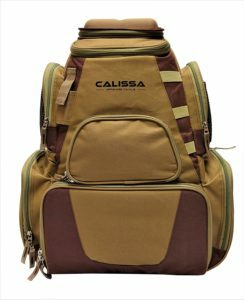 The Calissa Offshore Tackle Backpack may have a large capacity, but it is lightweight and durable. It measures 20H x 17L x 9W inches. It has multiple pockets for all your belongings including a hard-molded sunglass case. This also already comes with four tackle trays for organizing your lures and plugs. The straps are adjustable so that bag can fit comfortably on your back. The fabric is waterproof, so it really is designed for the water activity. Loved by many, this Wild River Tackle Tek Nomad backpack is definitely our top pick when it comes to fishing backpacks. It brings good value for its price of less than $108. This large backpack has four pockets on the sides, a spacious upper compartment, and a bottom compartment for the trays. This fits four #3600 trays and has a sunglass holder that is permanently mounted. Dawn or dusk you can go fishing because this bag has an integrated LED system. In case of rain, this comes with a rain cover to keep your belongings dry. There is also a removable plier holder that you can put on the bag or your belt, whichever is more convenient for you. Planning on a day of fishing? 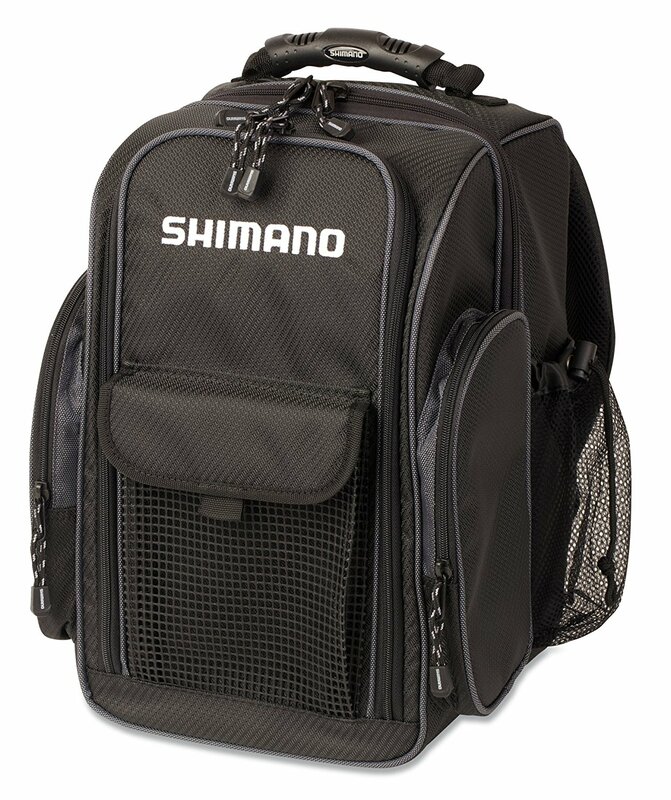 This Shimano Blackmoon Fishing backpack is for you. This small backpack will store everything you might need for a day’s worth out on the lake or river. This will cost you less than $120. This small backpack is made of textured fabric that is very durable. The front opening has two-way zippers so you can easily access your items. For extra storage, there are side pockets with zippers and mesh rod holders on both sides. This comes with two Plano 3750 utility boxes to organize your lures and plugs. The utility box compartment opens in the middle of the bag, and you need to unfold to get access. The shoulder pad of this backpack is thick-padded for your comfort. The purpose of a fishing backpack is to hold all your fishing tools in one convenient place, so you do not have to carry multiple boxes. The backpack you choose should be big enough and has plenty of space for everything you use on your fishing trip. Fishing backpacks come with multiple pockets for proper organization of your things. Take your time and assess everything you usually bring so you know how big a backpack you should buy. The backpack has to be durable. You will be carrying lots of stuff in there, and it will take a beating every time you use it. It should be made of strong materials that will not easily rip. It should also be waterproof. Since you will be out on or near the water, the backpack should keep your items dry, especially if you bring phones. Since you will be using this to hike onto your fishing spots, the backpack should be comfortable when you carry it on your back. You would not want to have a sore back before you even start to fish. Backpacks with thick padding should provide softness and comfortability. 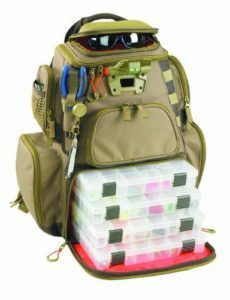 A fishing backpack should be able to solve storage and mobility problems you have with fishing boxes or bags. It is a convenient storage for all your fishing tools and equipment. It will be easier to hike and balance with both hands not holding too many things because everything will be in the backpack. Our pick of the best backpack you can get is the Wild River by CLC. It gives great value for its price. It has plenty of compartments to better organize your items. It sits comfortably on your back and has a classic fishing backpack look.